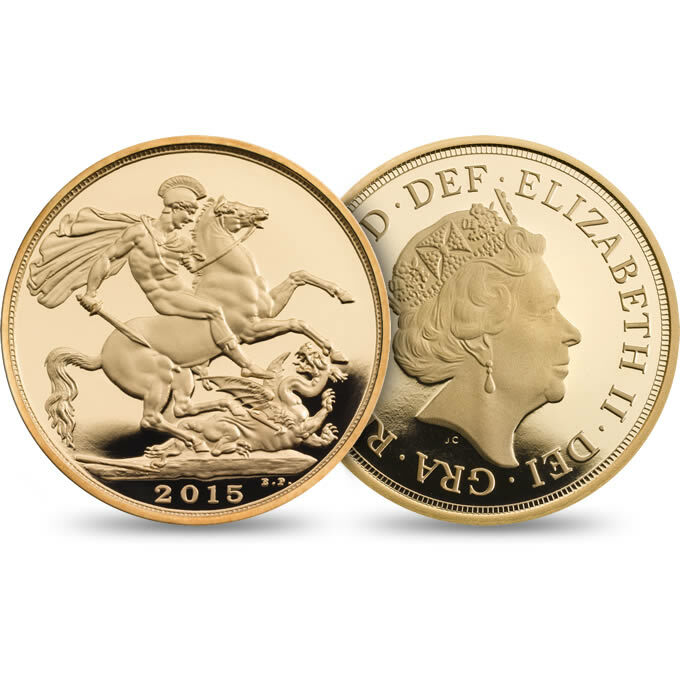 The 2019 Gold Sovereign Collection features the classic St George and the Dragon design, with lower mintages across the range than in previous years, coins are exprected to sell quickly. 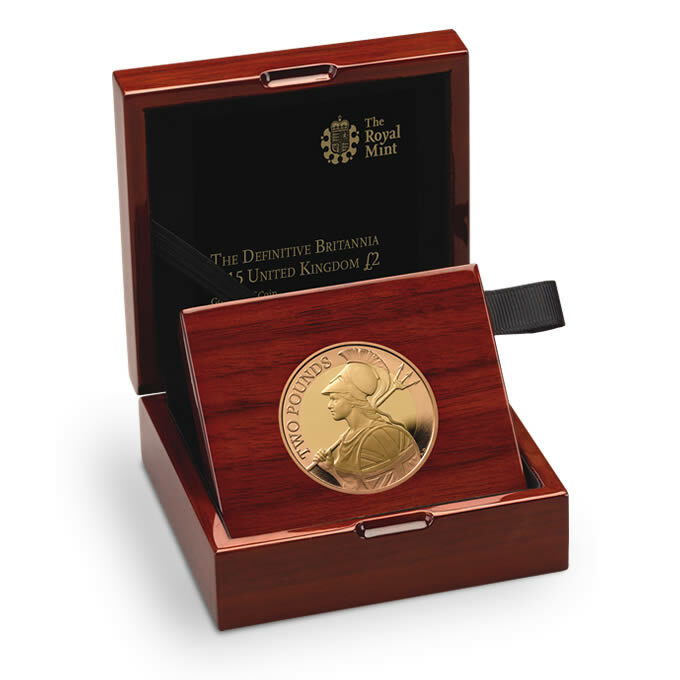 The coin is struck in 22ct gold and are boxed in luxury cases and come with a numbered certificate of authenticity from the Royal Mint. - Maximun Issue limit - 1,000 - Not included in any set. Celebrating a UK First, The Coronation of Queen Elizabeth II Took place 65 years ago in 1953, This year Her Majesty celebrates her Sapphire Coronation anniversary, No other Britiish monarch has reached this milestone, The Queen became the longest reigning monarch in 2015 . The coin features a special design of the Royal coat of arms by the Royal Mints own Stephen Taylor, The coin is limited to only a mintage of 550 pieces. The Classic Pistrucci design of St George and the Dragon once again features on the Sovereign and is joined by a special mint mark to celebrate the Queens 65th Anniversary. Celebrating 70 years of the marriage between Queen Elizabeth II and HRH Prince Philip, This coin struck in 22ct Gold to proof quality pays tribute to the strong enduring partnership that started in 1947 and has continued ever since. The coin features an obverse by Etienne Millner showing both Queen Elizabeth II and HRH Prince Philip, While the reverse by John Bergdahl shows the couple riding horses. After 8 Decades of loyal service to Queen Elizabeth II His Royal Higness Prince Philip stepped down from official duties in 2017, The Duke of Edinburgh has had a varied life, with a short career in the navy, until marrying The Queen and becoming a key part of the Royal family. The coin features an effigy of HRH Prince Philip by Thomas "Humphrey" Paget, This being his last commision with the Royal Mint. The 200th Anniversary of the modern Sovereign continues with these 2 releases, both featuring the original St George and Dragon with garter border by Benedetto Pistrucci from 1817, The £5 BU sovereign limited to only 1000 pieces is a must have for any collector. Also featuring the release of the first year of the Gold Proof Piedfort sovereign, Double thicknes, The first time the sovereign has ever been struck in this form. And it is expected that the mint will continue to run this series in the future, so be quick to secure your copy of this sold out piece. The only coin to mark the centenary of the House of Windsor, Struck in 22ct Gold and presented within a luxury case with a numbered certificate of authenticity, The coin limited to only 750 features a reworking by Timothy Noad of the badge of Windsor. - Featuring Reverse design based on the badge of the House of Windsor. Approved by George VI. Queen Elizabeth II became Queen in 1952, and in 2017 celebrates her 65th year, This is the longest any british monarch has reigned. and to celebrate the Royal Mint have released this superb £5 comemorative with reverse design by Glyn Davis. The Obverse features the Queens Current effigy by Jody Clark, and has the Edge inscription of " SHINE THROUGH THE AGES"
The 2017 1000th Anniversary of the coronation of King Canute £5 Gold Proof Commemorative is the first coin to ever celebrate the King, and also to commemorate a 1000th Anniversary. King Canute was crowned King of England in 1017 and protected the country against further raids by Vikings. Celebrating 200 years of the modern Sovereign. The 200th Anniversary of the modern Sovereign has arrived and this wonderful design for 2017 has come along too, featuring the original St George and Dragon with garter border by Benedetto Pistrucci from 1817, the sovereign celebrates its milestone by looking back to its beginnins. The proof coins are struck in 22ct gold to proof quality and all proof coins are boxed in luxury cases and come with a numbered certificate of authenticity from the Royal Mint. 2017 Bullion issues of the sovereign are also available, please contact us if you are interested in the new bullion issue or for quantity pricing. We expect stock to sell out quickly and prices may change. To celebrate the Queens 90th Birthday, the Royal Mint released this special £5 Commemorative crown featuring a reverse design by Christopher Hobbs, the design which features 9 roses represents each decade the queen has lived through. The coin is inscribed on the edge with the wording "FULL OF HONOUR AND YEARS", and carries the new Jody Clark Effigy of Her Majesty. 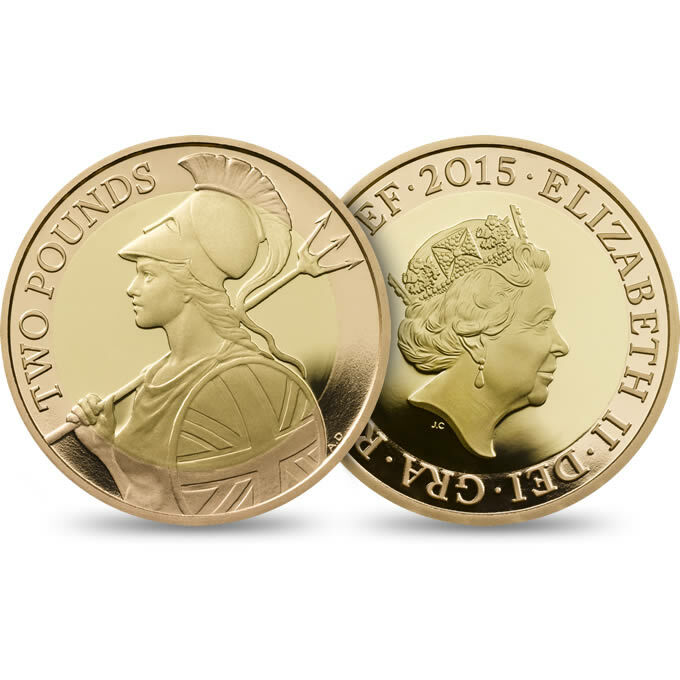 The coin is struck to Proof Quality and is made in 22ct gold. - Limited to only 900 in this presentation. Struck in 22ct gold with the classic St George and the dragon design on the reverse, the coin can only be the sovereign, and with 2016 comes a one off effigy design by James Butler MBR RA. This design will not feature on any other year and has been included to celebrate the queens status as longest reigning monarch. 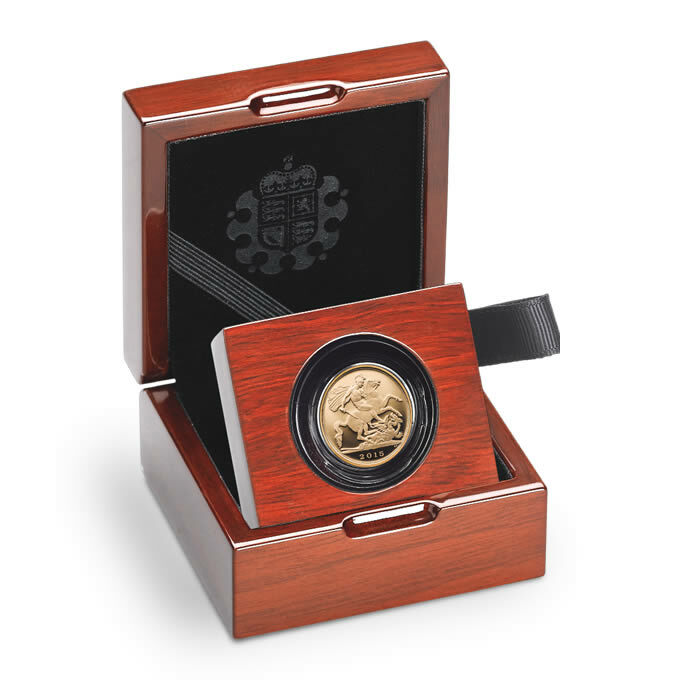 The coins and sets are as always presented in a wonderful luxury wooden presentation case with a uniquely numbered certificate of authenticity. - Struck with a one off 2016 only Effigy of Her Majesty by James Butler MBE RA. 2016 Bullion issues of the sovereign are expected in January 2016, please contact us if you are interested in the new bullion issue and we will contact you as soon as these are realsed. Our Majesty the Queen has beaten the record set by Queen Victoria to become our longest ever reigning monarch. Queen Elizabeth II has been queen for 63 years and counting and her reign has seen styles change, fashions come and go, and the world change in many ways. 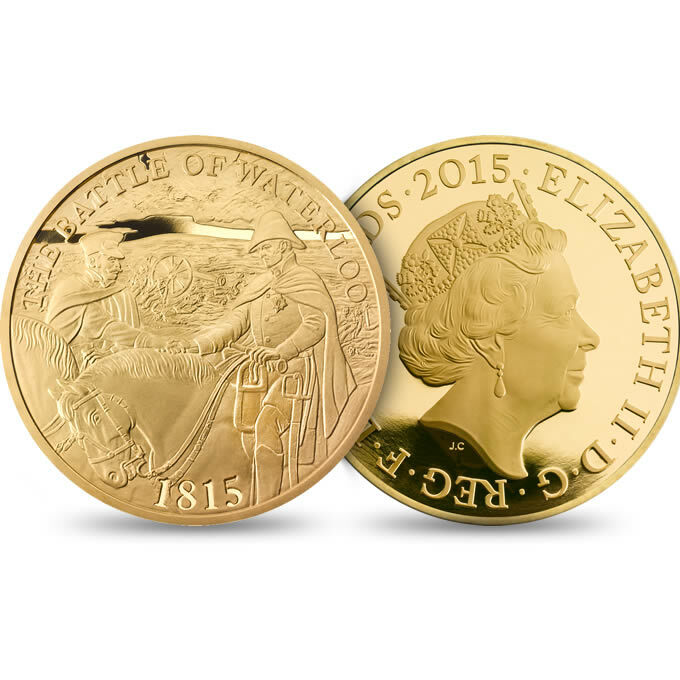 The coin itself is struck in 22ct gold and carries both the denomination of FIVE POUNDS and ONE CROWN. The effigy and reverse was designed by James Butler MBE RA, And the effigy of Her Majesty the Queen is an alternative version that will never feature on standard circulating currencey coinage. The Coin is limited to only 1000 individually presented with Certificate of Authenticity. To mark the 200th anniversary of the Battle of waterloo the Royal Mint have released this wonderful coin with its reverse designed by David Lawrence to celebrate the end of the battle when peace was finally reached. The coin carries the queens new effigy by Jody Clark, while the the reverse design detailing the moment peace had been found in Europe, showing the Duke of Wellington and Blúcher shaking hands. The Coin is limited to only 500 (bearing the queens new fifth portrait bust) individually presented with Certificate of Authenticity. Allgold Coins have always been at the forefront of the internet revolution when it comes to coin collecting and investing, and to keep at the front of this, we are very pleased to release our new site that does not only look fresh and modern but also is mobile friendly, so perfect to view at home on your pc or smart tv, or even on the go on your tablet or smart phone. We still have the same range and more available and still offer the same services as we ever did, and we are still here to offer adive and tips to collectors and investors new or old. We are really excited to announce we are expecting our first coins featuring the new fifth head portrait by Jody Clark in within the next 2 weeks. these coins herald in a new era as we say good bye to the 4th portrait we all know that has been on the obverse of all our coins since 1997. 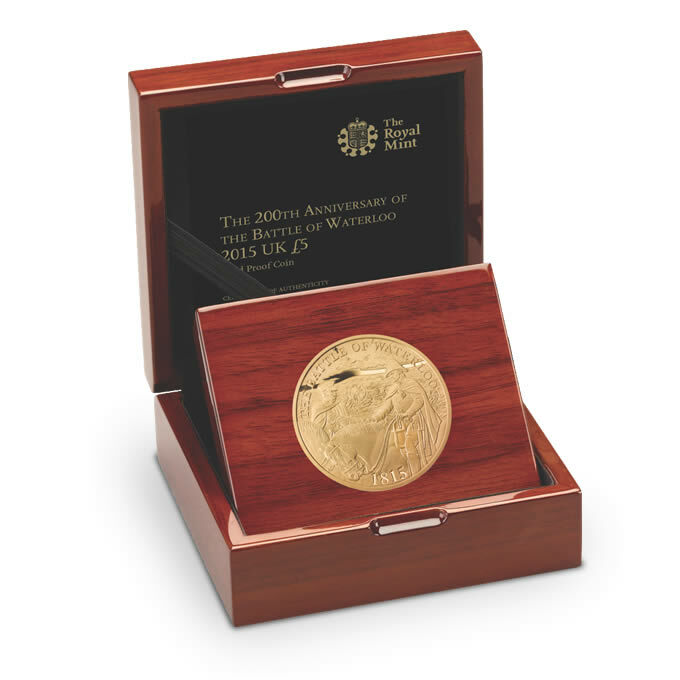 Both coins are struck to proof quality and are in 22ct gold, and are presented in luxury walnut presentation cases with numbered certificates of authenticity.